We are thrilled to announce that only a week after its release, we are now running Pike, the latest release of OpenStack, on all our public, private and hybrid clouds! Since OpenStack announced its 16th release, on August 30th our engineers have been working tirelessly to get our clouds upgraded from Ocata, the previous release, to Pike. As contributors to Pike’s open source code, we believe that the new features offered by Pike will help by improving manageability and flexibility. With the upgrade to Pike, users can now expect more control over resources being used and easier network configuration. Pike will also allow us to add multiple new services as well as release new features for existing services. Pike is now already integrated into our newly launched Kubernetes service which is currently running the latest version 1.7.4 with the help of the OpenStack project Magnum. Pike includes features such as support for Python 3.5 to prepare for the end of life of Python 2.x in 2020. This addition will improve performance as OpenStack and its APIs are written in Python. Users can now also benefit from features which enhances Cinder, Swift, and Neutron. The latest release includes a “revert to snapshot” Cinder feature which allows users recover data that has been corrupted or reset from running test by reverting volumes back to their most recent snapshots. By using the libvirt driver with Cinder and Nova, Pike also allows users to extend volumes that are in-use to add more capacity without shutting down virtual machines or bringing applications offline. Other additions include the ability of Cinder to act as a standalone storage service for virtual machines and containers using Docker or Kubernetes. Pike offers new features for Swift including that globally-distributed erasure codes are supported, which includes replicated erasure code fragments, composite rings for more explicit data placement, and per-policy config options. This will allow individual regions to function even if a cross-region network is down. Swift will send any failures in one region to other the remote regions to recover. Other additions include rolling upgrade support in Ironic and enhanced Ironic & Neutron integration. Pike allows for true multi-tenant capabilities by plugging bare metal servers into existing Neutron frameworks. Pike also features enhancements to the Kolla code, a tool to upgrade & manage OpenStack through services like Ansible and Kubernetes. We are excited to be offering the latest release of OpenStack this early. We are confident that Pike’s new capabilities will be greatly appreciated by our users. Want to try it out? 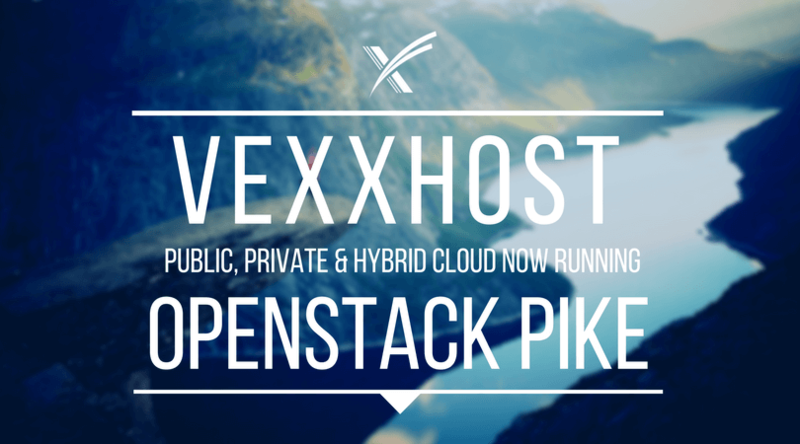 You can request a free trial bellow of our OpenStack Pike powered public cloud today.